There are few things more unsettling than when people utter the words “nut cheese”. I understand your concerns. You’ve probably been strolling the aisles of a Whole Foods and come across a slab of shrink- wrapped-orange-hell-sponge that they refer to as “Almond Cheese”. Don’t let that weird hunk-a-fake-cheddah ruin everything in the nut cheese family for you. Speaking as someone who once tried to make a grilled cheese with almond cheese (ugh), trust me on this. I’ve since gotten over my fears (we’ve even made some here before!). Heck, we’ve even made some delicious nut milk, and now we’re moving into some next level nut cheese magic: CHEESECAKE! When it comes to getting nutty with your cheese, the cashew is going to be your main squeeze. Did that rhyme? Feel free to print it on tote bags. That would be nutty! I know you’re rolling your eyes, but I can never stop the nut puns. It’s physically impossible. I’ve tried. It’s nut gonna happen–heyyooo! Oh gosh… it’s nut funny anymore. On a more serious note: CHEESECAKE! I mean, really. You can take this thing to a dinner party and you won’t have to explain to a bunch of people that it’s raw, vegan, paleo, gluten-free, refined sugar free, and has a bunch of nuts masquerading as cream cheese. People will have no clue. Unless they have nut allergies. Yes, then they might have a clue. Okay, best to disclose there are some nuts present in the cake to rule out any sudden swelling of airways… but, other than that THIS THING IS UH-MAYZING. Trust me. My mouth is watering just thinking about it. It’s a no bake situation, so it’s perfect for the summer. 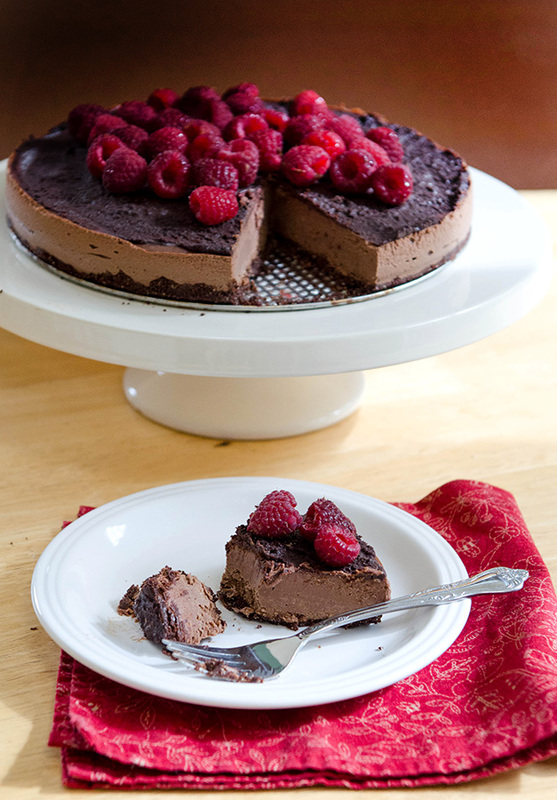 The layers are super rich and fudge-y and the raspberries give it a little extra kick. Who doesn’t like chocolate and berries, amiright? Not to mention, it’s a pretty lil’ cake. It makes a great impressive dessert for a dinner with friends. I toted this here cake over to a friend’s place after I was done taking its picture (cake-ing alone can prove dangerous) and it was a huge hit. I might have even abandoned the rest of it as their apartment. There were talks of digging it out and eating the leftovers for breakfast. Always a good sign. For the crust: Place all of your crust ingredients into a food processor and pulse until they come together. You want the mixture to be slightly sticky. Dump the mixture into a 8-inch springform pan. With clean fingers, press the mixture down into the bottom of the pan evenly, forming your crust layer. Set aside. 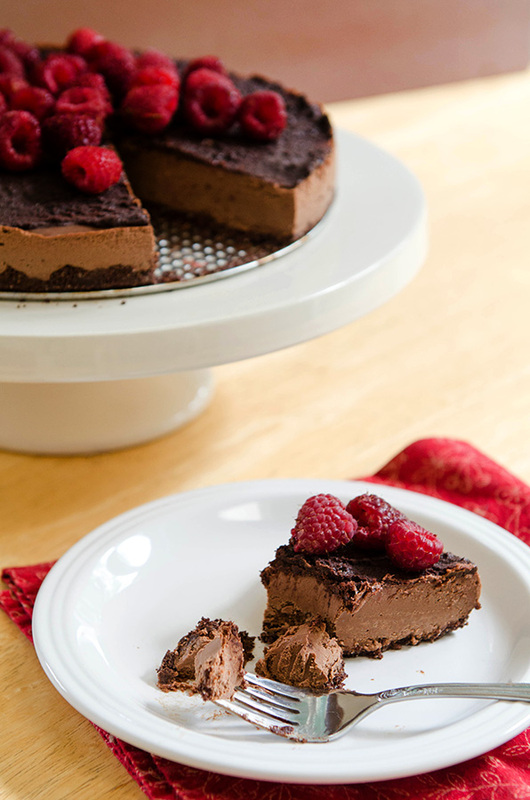 Once it's creamy, add in your raw cacao powder, coconut oil and raspberries. Blend again until creamy. You might have to scrape down your sides a couple of times and blend again. For the ganache: Melt your chocolate chips and coconut oil in a double boiler. Whisk together. Pour layer of ganache over the top of your cheesecake. Top with raspberries. Serve immediately or place in the refrigerator or freezer until you are ready to serve. If you are storing for longer than an hour, I would put it back into the freezer. Enjoy! Welp, I need this cheesecake in my life STAT, especially since regular cheesecake and me don’t really get along anymore due to the whole lactose intolerance thing and it being made entirely of dairy and such… I’ve never made anything with nut cheese before, though, and it’s been scary even thinking about it. I trust you won’t steer me wrong, though, and I kind of can’t wait to try this. YUM. Chock fulla nut puns! Love it. I’m also really admiring your relative restraint, keeping most of that nuttage out of gutter and all. I lack said restraint. And on that note, should be on my merry way before things get triple-R-a-la-Xtina drrrty around here. Buhbye. This checks a lot of boxes for me. Double dark chocolate, check. Raspberry, check. Vega? .. Check! I’m making this cheesecake over and over again. I’m not really the type of commenting on recipe’s success or fail but i had to come back around here, on my way back from my friend’s dinner, to actually tell EVERYBODY to try it out! It is amazing, all of my friends loved it! Made this for the family when we had a guest over, it was absolutely delicious and beautiful – and fun to make! One of the best vegan recipes I’ve ever made! My college daughter is lactose and gluten intolerant, and it was so great to be able to make a yummy dessert that she could enjoy too, that being said I would make it again even if she’s not here! This looks delicious and I am excited to try it! But I also gave an almond intolerance. Is there a good substitute for almond meal that you would recommend in this recipe? This counts as pie, right? Doing it. For Thanksgiving. But, with cherries bc that’s what I have. I want this NOW. And all to myself. No, really. NOW. Good, work Gina pants, good work! Just wondering if you used canned coconut milk (full fat) or regular drinking coconut milk from dairy section? And can I use almond milk instead? Full fat canned coconut milk. I wouldn’t recommend almond milk since I don’t think it would give it the right consistency. If you try it, let me know how it goes. 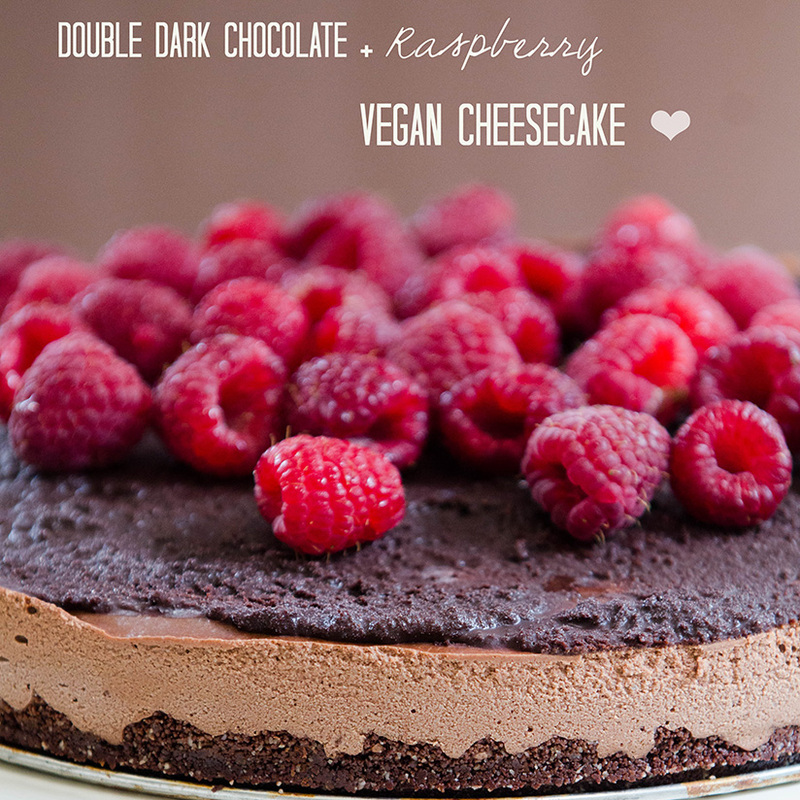 I would love to make this cheesecake, it looks gorgeous! I have one question: The raspberries won’t make the filling look pinkish/red, right? Yours look light brown which is great! I am just afraid that the raspberries will change the color of the filling but if that’s how you did it, I will do the same. Nope, the cake pictured is the same one as in the recipe. You’re all good. Yay!!! So glad you enjoyed it. This is one heck of a summer dessert. Now I want to make one again. Hah. i made this desert and it truly was amazing! My friends loved that it and didn’t question its ‘cleanliness’ lol! Now, I was hoping to make my husband a version of his favourite ‘peanut butter pie’ for his upcoming birthday, do you think it would work to sub the raspberries in the filling for peanut butter? I’m afraid to change anything in such a good recipe but it was so good and other vegan/paleo style recipes just don’t seem as good. Thanks! I’m just wondering: when it says “vanilla”, do you mean extract? Amazing! Thank very very much for sharing this yummy recipe Gina! I did this cake two times now and the first time the crust didn‘t stick together at all.. The second time I added coconut oil to the crust ingredients and that worked very well. What are your experiences – did the crust ingredients stick together even without adding something liquid?